The New Zealand Film Archive has been aware of the ‘institutional gap’ in this country for several years, with regard to the lack of representation of video games & early computer games within national cultural collections. 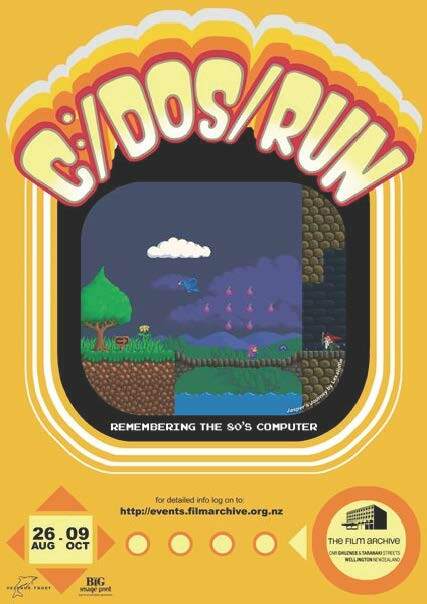 In 2005 when the NZFA held an exhibition called C:/ DOS / RUN – Remembering the 80’s Computer, we attracted record crowds at the time, and quickly realised there was a lot of public interest in the local history of computers and gaming software. 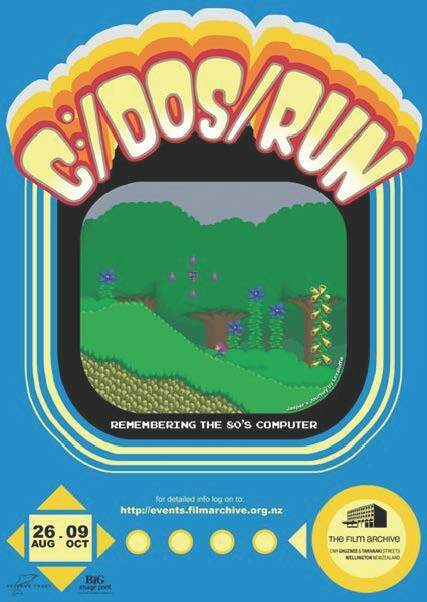 C:/DOS /RUN: REMEMBERING THE 80’S COMPUTER : Featuring NZ game ‘Jasper’s Journey’ by Lexaloffle (developers John & Joseph White), which premiered at The New Zealand Film Archive in the 2005 exhibition . Full colour illustration, red border. Poster design by Kerry Ann Lee. Around this time we had collected only the odd NZ game, like Sidhe Interactive’s Gripshift and some examples of retro hardware, and didn’t have a strong rationale to drive the acquisition needed to develop a game collection. The NZ Film Archive has a broad mandate to collect, preserve and connect New Zealand moving image content, for the NZ public. Our holdings have always been considerably broader than the name ‘Film Archive’ implies, but when it came to ageing game software written in obsolete computer language and for specific platforms & hardware, that are also verging on extinction … the many preservation questions and lack of expertise held us back from actively acquiring this material. Much of the impetus behind this new focus at NZFA has to do with the realisation that if we, as a public institution, don’t begin to collect what is still around, then a sizable chunk of local, late 20th century cultural history could be lost. In short, the game preservation crisis has already claimed victims, in that many of the earliest games and consoles from the 70’s have already been lost, and with the decay of silicon chips and demagnetisation in floppys (etc), the 80’s is not far behind. The main shot in the arm for NZFA was being able to partner in 2012 with the Play It Again project, which is developing migration software solutions as an alternative to the usual emulation route. We are wanting to acquire working examples of software and hardware across the range of formats and platforms that represent the variety that was available and played on amongst the NZ fan communities. There is a focus on the early period, from the late 70’s up through the 80’s, due to the scarcity of original still-working examples. Coupled with the games and their hardware, we are also collecting supportive documentation like computer programmes, graphical artwork, packaging and promotion material. Also we are acquiring computer magazines and fanzines of the period. Our other intention is to record some oral histories with early NZ game developers and with some of the key retro-game collectors. As a national archive with clearly defined selection and acquisition policys, the preference is for games written by New Zealanders, whether unique works or ‘adaptions’ of known games, and computer hardware designed in NZ, including handhelds, consoles and arcade games. We would love to add an Aamber Pegasus computer to our collection or an MDL — two rare and genuine NZ-made computer systems. While the ‘product of New Zealand’ tag will always be prime focus, we acknowledge that this somewhat limits the scope of potentially collectable material, particularly in the early period of the 80’s, and so we want to also reflect in the collection the range of platforms and computer systems that were available and imported here. Gather working examples of all of the micro’s and game systems that NZ fan communities were interacting with, and so build-up an historic window of the period that truly reflects what platforms laid the groundwork for future game programmers, software designers and IT specialists in this country and beyond. In recent years New Zealand’s game development industry has grown significantly, and in particular with the growth of digital games globally and digital distribution, video games are now one of NZ’s largest creative IP exports. With rapidly changing platforms for gaming and the generally short shelf life, surprisingly little thought is ever put into the future safekeeping of source code, let alone development stage ephemera such as design documents and early artwork. While our collecting and preservation focus will remain with the most at risk games in the 30+ years category, we will also continue to make connections with contemporary local game industry and encourage rights holders to deposit their digital code, along with design documents and development notes that provide helpful context. There is of course a whole raft of different preservation issues associated with digital distribution security and DRM —- but for the moment none of these current games can be considered at risk. NZFA has collected a variety of game / computer material from several different collectors, including a Malzak arcade cabinet and a sizable collection of Atari computer modules and accessories. Software items include floppy disks that come in 8”, 5 1/4”, 3 1/2” and 3” sizes. 8-bit data cassettes of various lengths and the very common ROM Cartridges that existed before many of the other formats and are even still used in some hand-held games today. Other oddities are essentially dedicated game devices like the Sportronic Light Gun and console, and a Grandstand pocket arcade. We are particularly keen to collaborate with retro game (software & hardware) collectors who are willing and able to work with us: both in terms of entrusting collections & collection items into our care, and especially with the transfer of specialist knowledge —- at this time this would need to be on a purely voluntary basis, but could lead to some short-term contractual work. For the time being the efforts of NZFA will be concentrated on simply collecting gaming software and hardware as already outlined —— wherein at all possible in still working condition. The hardware will be useful for extracting source code and for exhibition use in time, but initially at least we plan to simply maintain and conserve working systems, through basic care and storage in climate-controlled cold vaults. The hope is that we can collaborate more with retro collectors who are not only passionate about these old games, but have often already discovered preservation solutions, whether they be clever mechanical fixes for arcade joysticks or a homebrew solution to playing a game on an old console, for example. Ultimately we hope to acquire both the knowledge and collections from some of these passionate gamers who desire that their work be made available for public access, and in attempt to preserve it for future generations. I hope that in time we will be in a place where we can offer employment to a specialist with electrical engineering expertise and/or computer electrical engineering, so that we can repair and truly conserve the older games. A large part of the preservation process for us is to record every step performed on collection material in a digital form. The creation of notation: instructions, manuals and documented techniques on the conservation steps taken, whether they are code emulation or electrical repair. Collection items are photographed and the resulting files are themselves duplicated and stored in archivally safe ways. The aim is to create an archive for not only the collection items but also the entire archival process, so that it becomes a self-maintaining system. For further info or any enquiries related to the above, please contact Shane Farrow, Collection Developer and Video Games Project Leader at the New Zealand Film Archive.